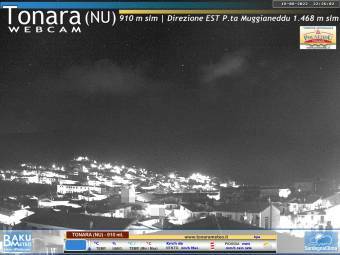 It's 07:08 in Tonara (Sardinia), Italy right now. Monte Muggianeddu A very nice panorama view over the town of Tonara with Monte Muggianeddu in the background. Santa Maria Navarrese: Gulf of Arbatax, 27.2 miles away. Santa Maria Navarrese: Livestream Strand, 27.2 miles away. Arbatax (Sardinia): Livestream Arbatax Red Rocks, 28.9 miles away. Bonorva: View over Bonorva, 34.5 miles away. Ozieri (Sardinia): Ozierimeteo, 41 miles away. Cagliari (Sardinia): View over Cagliari, 55.8 miles away. Cagliari (Sardinia): Livestream Port of Cagliari, 55.8 miles away. Alghero (Sardinia): Interactive Live Webcam from Alghero Sardinia, 58 miles away.